Auguste Rodin (1840–1917) is often thought to be one of the most important sculptors in the modern era. He had a unique ability to create works of art that emphasized the emotions of individual through detailed, textured surfaces. During his prolific lifetime he created thousands of sculptures. I decided to venture to Palo Alto, CA to view over 500 of his works on display at the Stanford Sculpture Garden and Cantor Center. Much like Rodin’s own process of studying his clay models from all angles, I took my DSLR camera to capture and document these intricate bronze sculptures in the round. I chose four sculptures and walked in a circle about 5 feet away from each one, taking a photo every 5 degrees or so. This resulted in about 50-75 images per sculpture. Once at home, I imported these images into 123D Catch to begin the process of creating the 3D models. It took 123D Catch about 30 minutes to process each set of photos and generate the model. The next part took some time (and patience) on my end because I had to remove all background data points, fix holes where data points were not measured (this was often was due to my inability to get my camera high enough to capture the tops of objects). 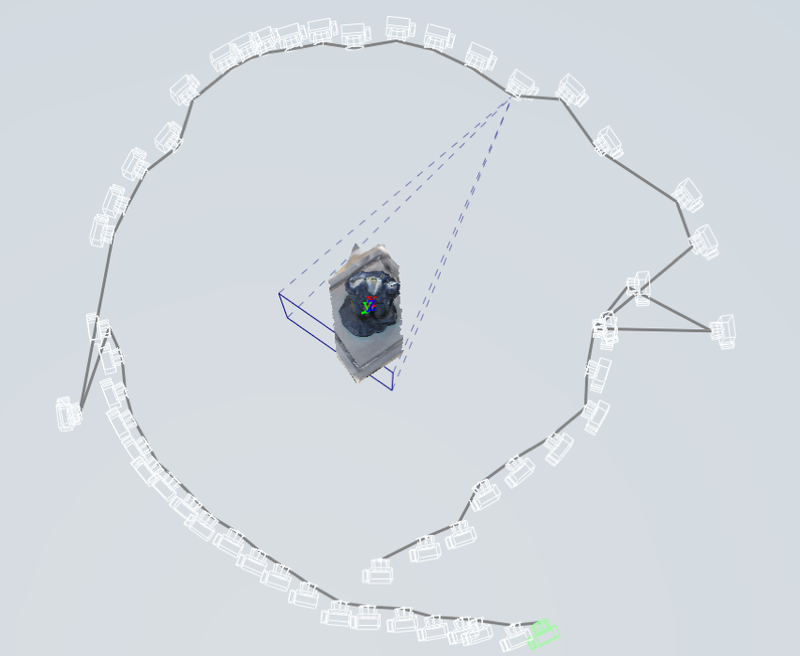 Finally, I generated paths for the virtual camera to follow in order to create the videos below. I felt that this was a relatively successful project, especially considering it was my first time working with the software. That being said, the outdoor elements in Palo Alto were a bit of a challenge. I think having more control of the lighting to minimize the harsh sun, which created deep shadows and shine on the bronze, would make for a smoother 3D model. In addition, I would add a portable photography backdrop to eliminate other background objects like people, baby strollers, stairs, and parts of buildings. Next time, I would like to try photographing sculptures indoors with more consistent light and a screen in order to compare the amount of detail. Are these available as models? I’d love to try 3D printing them!